President Donald Trump's spur-of-the-moment decision to agree to a face-to-face meeting with North Korea leader Kim Jong Un represented an unprecedented opportunity, but also a huge risk, most recently highlighted by a case of cold feet on both sides. 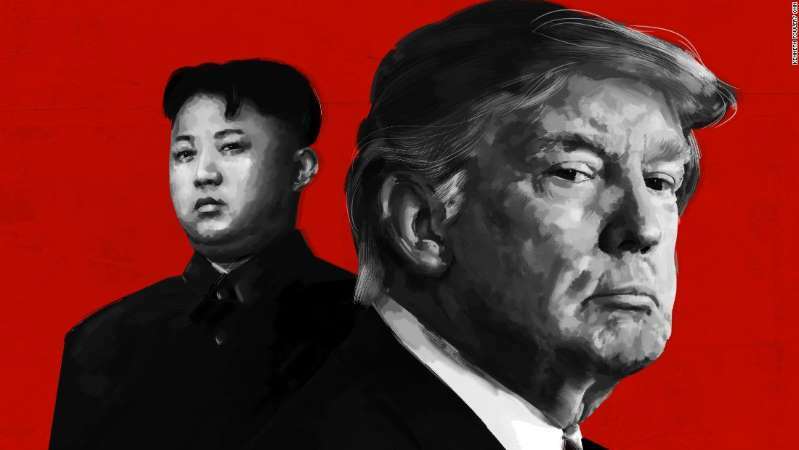 Anticipation about the June 12 meeting in Singapore is turning to pessimism, as the complexity of the initiative, the stark divides between Washington and Pyongyang, and inconsistencies in the White House's approach to the meeting all become clear. First, the Kim government threatened to pull out, blaming the "repugnance" of national security adviser John Bolton and his nuclear disarmament schemes. Now Trump has switched from dreaming of Nobel prizes to warning that there is a "very substantial chance" that the meeting will not happen next month. Trump is also speculating that China's President Xi Jinping, who he called a "world class poker player" on Tuesday, may be behind Kim's new hard line. The atmosphere has soured from the euphoric optimism with which Trump welcomed home three US prisoners from North Korea two weeks ago to doubt and uncertainty. There seems a good chance that the challenge coins minted by the White House Communications Agency to commemorate the summit may get left on the shelf. "If it doesn't happen, maybe it'll happen later. Maybe it'll happen at a different time, but we will see," Trump said, alongside South Korean President Moon Jae-in at the White House on Tuesday. So what is behind the sudden outburst of pessimism about what would be the most spectacular diplomatic summit in decades? One explanation is that both the United States and North Korea, as they get past the initial wave of enthusiasm after Trump agreed to meet Kim, are being reminded of just how intricate their differences are. The idea that Kim would give up a nuclear arsenal his country has spent decades acquiring and that he sees as the guarantor of his dynastic rule always struck many people who have dealt with the North Koreans as farfetched. The fact that goal seems so distant and could take years of painstaking negotiations to achieve after a Kim-Trump summit may be what is fueling rising skepticism among some White House officials that the summit will take place. It's conceivable that Kim may be realizing, as North Korea invited journalists to watch the destruction of a nuclear test site Tuesday, exactly what the kind of aggressive verification measures the US is demanding would mean for his country. "There is a whole lot of sites that are going to have to be shut down (and) inspected. This is going to take months and years," Michael Anton, Trump's former National Security Council spokesman, said on CNN's "Erin Burnett OutFront." The first sign of trouble came when Kim made an unexpected visit to China earlier this month to meet Xi and said he was aiming for a "phased and synchronous" process that would offer North Korea step-by-step rewards for renouncing its nuclear program. That is exactly the approach that Trump says failed for previous administrations. This White House is telling the North Koreans they will get a bonanza of US private-sector investment only once the nuclear program is completely dismantled. Then last week, Bolton went on television to tout his vision for a Libya-style export by North Korea of its nuclear weapons program -- without upfront incentives. But when Kim hears Libya he thinks of the assassination of its longtime dictator, Moammar Gadhafi, after a NATO-led air operation in 2011 that may not have happened had he not previously given away a nuclear program that was far more rudimentary than North Korea's. In a bid to keep the summit on track, Trump hurriedly said last week that he was not contemplating using a Libya model for North Korea. Secretary of State Mike Pompeo said on Tuesday that he was pressing ahead with plans for the summit -- and was not looking at any date other than June 12. "We're driving on. ... I am optimistic, but again this could be something that comes right to the end and doesn't happen," Pompeo said. The run-in to the summit is also being clouded by uncertainty over the shape of the administration's position. Bolton's comments have, for instance, sparked a backlash in the media and among experts in South Korea. The confusion is bearing out warnings by former officials that the Trump administration should have gotten its ducks in a row before agreeing to a summit. "We are bumbling into this summit where there is no agreement even among the members of the US administration about where this is going and what are our goals," Jamie Metzl, who served on President Bill Clinton's National Security Council, told CNN's Jake Tapper on "The Lead." Tough talk from Trump and other members of the administration on what will happen to Kim if he doesn't toe the US line may also risk alienating the North Koreans. "This will only end like the Libyan model ended if Kim Jong Un doesn't make a deal," Vice President Mike Pence told Fox News on Monday. Michael Green, who served as the top White House East Asia hand in the George W. Bush administration, said such rhetoric could play poorly in Pyongyang. "The rhetoric matters, and we know the North Koreans are very sensitive and very insecure about any narrative about assassination," Green told CNN's Brian Todd. Some analysts believe that the summit is so politically valuable to Trump that he will do almost anything to keep it on the schedule. Indeed, on Tuesday, he guaranteed Kim's safety if he gives up nuclear arms. The President has described Kim as "open" and "very honorable" in recent weeks, an outburst of flattery apparently designed to bring him to the table. The President relishes dramatic made-for-television occasions that capture the world's attention. The administration has also argued that his North Korea diplomacy is one reason why he should not be distracted by Robert Mueller's special counsel probe. And Republicans hope to use the summit to shape a "peace and prosperity" campaign in tough midterm elections in November. By expressing public doubts about the summit actually taking place, Trump could also be following his customary habit of building suspense ahead of a big show. "Whether the deal gets made or not, who knows. It's a deal. Who knows. You never know about deals. You go into deals that are 100% certain, it doesn't happen. You go into deals that have no chance, and it happens, and sometimes happens easily," Trump told reporters Tuesday. Alternatively, by playing down expectations that the summit will happen the President could be preparing a face-saving exit for himself -- or indulging in a bit of pre-summit negotiating -- on television where Kim can see exactly what he is saying. Whatever the motivations of the key players, though, the risks of the diplomatic process crashing to a halt are grave, given that a return to the "fire and fury" rhetoric of last year could take the US and North Korea back to the brink of what would be a disastrous war for everyone.